To get the best performance out of your garage door and minimize the chance of a breakdown, its best to arrange a maintenance session at least twice a year. Our team has the breadth of experience necessary to examine garage door systems of all kinds for signs of wear and tear, and will help you to take the steps necessary to prevent a failure. 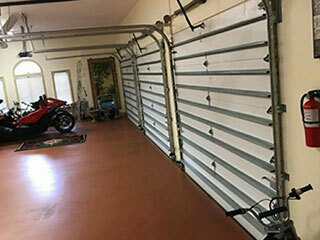 The most common failure point of a garage door is the stress placed on the springs, rollers and other moving parts when the door opens and closes, especially those that are exposed to the weather. Our team will look for signs of cracking, rust or fraying, and realign any parts that are coming loose. We'll also apply a fresh coat of lubricant to keep everything gliding along smoothly until the next appointment. Many garage doors have some exposed wiring. The opener, sensors and remote control system, as well as any 'smart' components you might have installed, are at risk of wiring failures or internal circuit board/breaker issues. By giving the wiring a thorough inspection for signs of fraying or loose insulation and testing each powered component, we can help to minimize the chance of an electrical failure. Remote controls and receivers, optic safety sensors and smart systems can suffer mechanical or electrical breakdowns - some components can also experience software glitches or malfunctions. We’ll test your intercom and remote control systems from a number of different angles and ensure your safety sensors are aligned and functioning properly. Waiting for your garage door to experience a problem is a recipe for unnecessary frustration and expense, and possibly real danger to yourself and your family. Give us a call today, we'll have our expert team on its way to your house at the soonest convenience.